REPORTS - Site de spbbf ! Pictured is Christian Pothier of Tahiti and Philip Hope of New Zealand and Cook Islands following an important meeting to discuss the Continental Championships calendar for the next five years in New Caledonia. 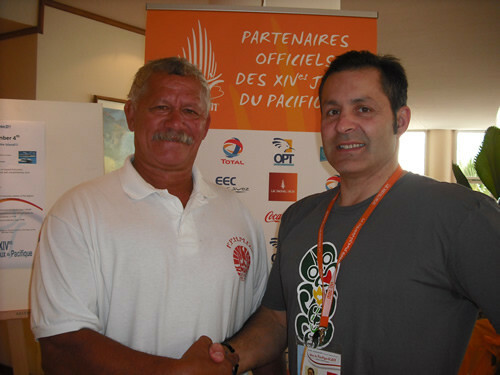 Christian Pothier, Executive Vice President of the South Pacific Bodybuilding Federation (SPBBF) is also attending the Games as the IF delegate for Powerlifting and a senior Judge for Bodybuilding, (he is also President of the Bodybuilding Federation in Tahiti/French Polynesia) having brought a full team of bodybuilders to contest the 2011 Pacific Games in New Caledonia. Philip Hope is President of the South Pacific Bodybuilding Federation (SPBBF) and WBPF Vice President for Oceania and he is attending the Games as the IF delegate for Bodybuilding, a role he has ably fulfilled in support of Games events since 2001. The 2011 Pacific Games which opened on Saturday 27th August 2011, also saw the first meeting of the Pacific Games Technical Committee, at which International Delegate Philip Hope of the WBPF and Director of Bodybuilding for New Caledonia Gaetano Barbato of New Caledonia briefed the member countries in relation to the event and stewarded the election of the PGC Technical Committee which oversees the logistics and delivery of the 2011 Pacific Games. Andrew Minogue, Executive Director of the Pacific Games Council and Chef Demission for Cook Islands, George George were also in attendance and both were elected/appointed to the PGC Technical Committee. Pictured are the Technical Officials representing all countries of the Pacific, including esteemed officials; George George, Andrew Minogue, Bodybuilding IF Representative Philip Hope and Games Director for Bodybuilding Gaetano Barbato. World Bodybuilding & Physique Sports Federation (WBPF) Vice President & South Pacific Bodybuilding Federation (SPBBF) President, Philip Hope, presenting his esteemed colleague and friend; Vui Tapasu Leung Wai, President, of the Samoa National Olympic Committee; Associate Minister of Foreign Affairs for Samoa, Retiring Executive Vice President of the SPBBF and President of the Samoa Bodybuilding Federation, with a special Gold Medal & Gold Pin to recognise the eighteen years of dedicated service Tapasu has given the South Pacific Bodybuilding Federation, having hosted numerous continental championships in Apia, Samoa; 2002, 2007 and 2008, including the 2007 South Pacific Games, Samoa having also supported the Inaugural WBPF World Championships held in Dubai. Vui Tapasu Leung Wai's, Ministerial commitments for Samoa and also his responsibilities as Vice President of the Commonwealth Games Federation (Samoa is hosting the 2015 Youth Commonwealth Games) prevented him from serving for a further term on the Executive Committee of the South Pacific Bodybuilding Federation. President of the SPBBF, Philip Hope said, "We really value Tapasu's tremendous contribution during many years and also his continuing interest and support of our beloved sport, bodybuilding across the Pacific Rim in conjunction with the SPBBF and it is with great pleasure I advise that Vui Tapasu Leung Wai was appointed "Honorary Life Member of the South Pacific Bodybuilding Federation" at the 2010 SPBBF Congress held in Noumea, New Caledonia on the 15th October 2010." 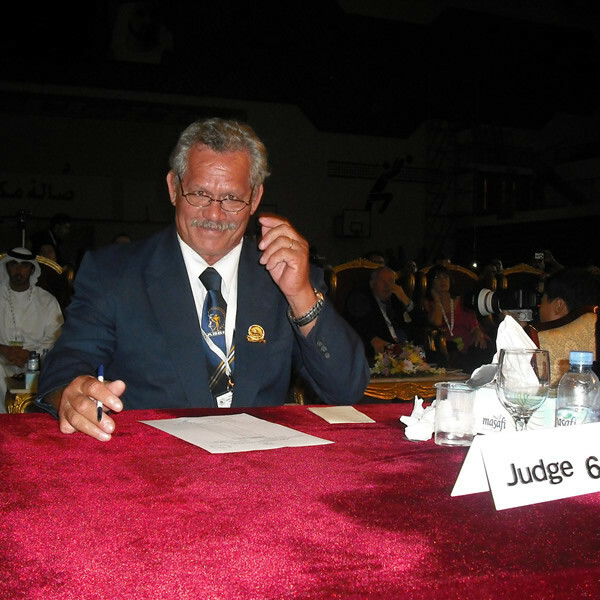 Of the sixty four (64) bona fide member federations that participated at the hugely successful 2009 Men's WBPF World Bodybuilding Championships in Dubai, the Pacific was well represented with judging duty. 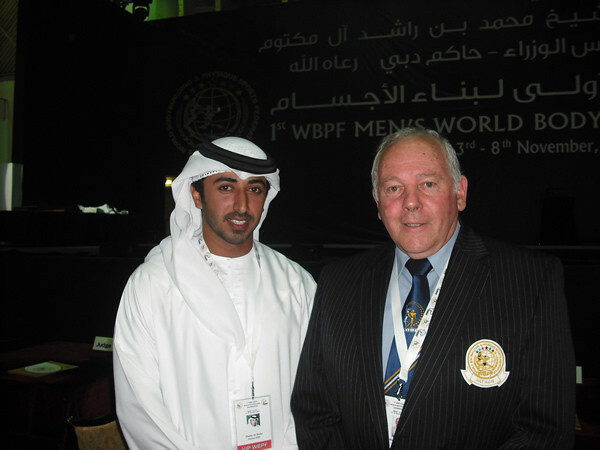 Newly appointed Patron of the WBPF, Warren Langman, is pictured with Founding President Osama Al Shafar in Dubai at the Inaugural WBPF Men’s World Championships held in Dubai. 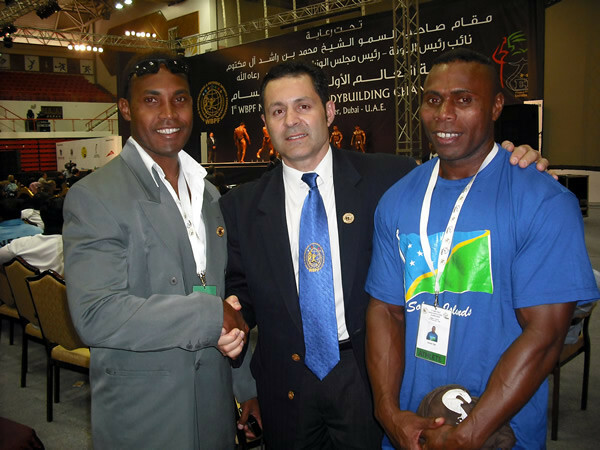 Philip Hope, Vice President of the WBPF acknowledging to his right, Francis Idu, President of the Solomon Islands Bodybuilding Federation and fellow athlete Amos Sui who contested the U85KG Class. 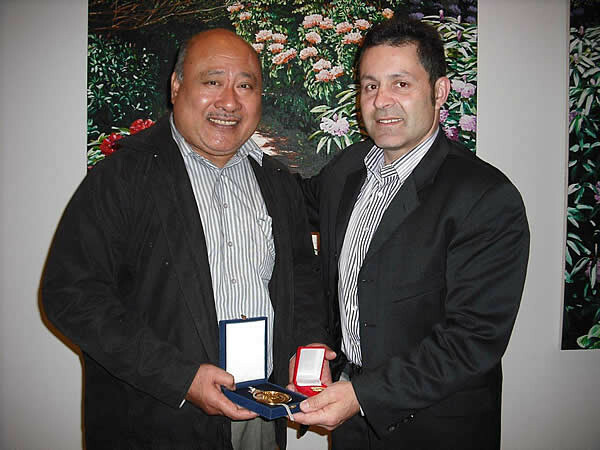 Pictured is Founding President of the WBPF, Osama Ahmed Al Shafar with Alan Tano, Secretary General of the Niue National Olympic Committee. During his good will tour of the South Pacific, Paul Chua took the opportunity to travel with his colleague Philip Hope to meet with Charles Cali, President of the New Caledonia National Olympic Committee to convey sincere thanks to President Cali and all members of the New Caledonia delegation for their continued support of bodybuilding (which is on the programme for the 2011 Pacific Games) and their unwavering support of the South Pacific Bodybuilding Federation which will steward/manage all aspects of the sport at these upcoming Games. The Pacific Games Council recognises the South Pacific Bodybuilding Federation (SPBBF), accordingly the Organising Committee of the 2011 Pacific Games (New Caledonia) are dealing directly with the South Pacific Bodybuilding Federation for all aspects of bodybuilding’s participation at this major Games event which will be held in Noumea. 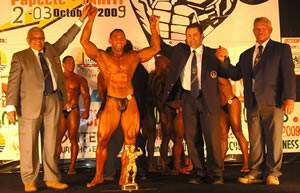 The 2009 South Pacific Bodybuilding Championships were a tremendous success in that more than 40 athletes from throughout the Pacific Rim participated in the finals event which was held in Punaauia, Tahiti (hosted by the Mayor at City Hall). Recognised for his contribution to Bodybuilding. All member countries of the South Pacific Bodybuilding Federation (SPBBF) unanimously rejected affiliation with the IFBB at the 2009 Congress held in Tahiti, Friday 2nd October 2009 (the SPBBF Congress was hosted by the Mayor of Punaauia in his City Hall Chambers). The Mayor of the Municipality of Punaauia, Tahiti, Mr Rony Tumahai Host of the 2009 South Pacific Bodybuilding Championships and the South Pacific Congress was presented with two special awards to acknowledge his tremendous support of bodybuilding in Tahiti and the wider Pacific rim. 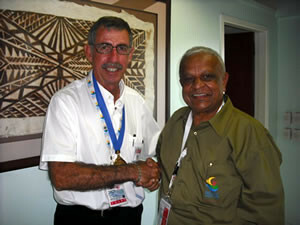 Host of the 2009 Oceania National Olympic Committees (ONOC) General Assembly. 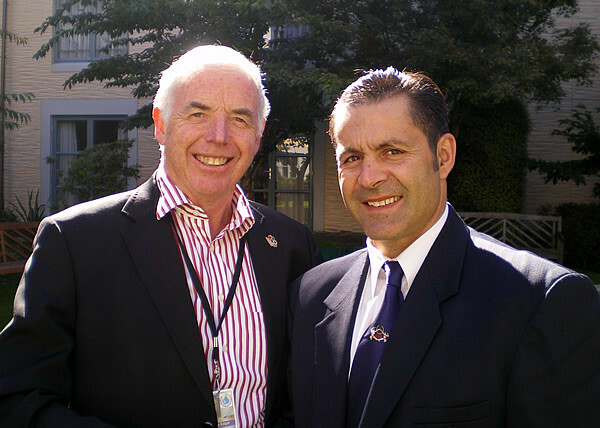 Philip Hope, Founding Member & Director of the World Bodybuilding & Physique Sports Federation (WBPF), President of the South Pacific Bodybuilding Federation (SPBBF) is pictured with Eion Edgar (then) President of the New Zealand Olympic Committee (NZOC) in Queenstown which is situated in the lower South Island of New Zealand, Aotearoa. 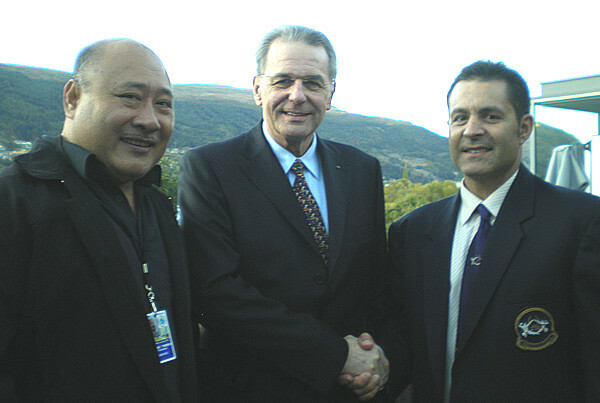 Eion Edgar was instrumental in hosting the 2009 Oceania National Olympic Committees (ONOC) General Assembly in Queenstown, New Zealand, Aotearoa which was also attended by Olympic delegates from throughout Oceania including IOC President. Dr Jacques Rogge, and his wife Dr Anne Rogge. During the General Assembly, Eion and his lovely wife kindly hosted a special function for esteemed IOC & ONOC Officials at their beautiful home at the lakeside in Queenstown. Years of effort in the Pacific, in spite of the huge distances and cost of annual participation has been rewarded with the knowledge that "all member federations" within the Pacific region that are active in the sport of bodybuilding are recognised by their NOC. 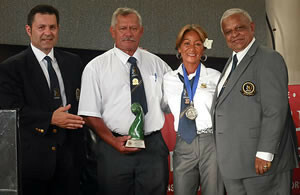 The sport of bodybuilding is also now a respected sport that is recognised by the Pacific Games Council (PGC). This 100% NOC/IOC affiliation is a great endorsement for the sport of bodybuilding and the efforts of the South Pacific Bodybuilding Federation (SPBBF) which is affiliated to the World Bodybuilding & Physique Sports Federation (WBPF). All member federations of the Pacific believe if this status is mirrored by other continents it will significantly enhance progress for the sport of bodybuilding to achieve official recognition by the IOC. Certainly with the formation of the WBPF and the great efforts of the Asian Bodybuilding Federation (ABBF) we believe this status will become a reality. Pictured attending a special ONOC function is Philip Hope, President of the South Pacific Bodybuilding Federation & Founding Member/Director of the World Bodybuilding & Physique Sports Federation (WBPF) together with his colleague and friend Vui Tapasu Leung Wai, President of the Samoa National Olympic Committee & Executive Vice President SPBBF, both of whom who enjoyed the opportunity to meet and share in the company of Dr Jacques Rogge, IOC President in conjunction with the 2009 Oceania National Olympic Committees, General Assembly.